Children will learn and grow this school-year by exploring and discovering our world through fun and engaging, hands-on activities that stimulate and fascinate their growing minds, bodies and spirits. Within a safe environment, children will interact with our furry and feather little friends, make music come alive, soar through our solar system, engage in interactive nature workshops, and ignite their imaginations with a year filled exploring the world we live in. School activities Include: High-quality, age-appropriate, full-day, fun and engaging child-centered classroom learning environments where year-round nature and science workshops, art and crafts, healthy cooking activities can be found, everyday. 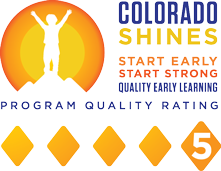 Students may also be eligible for the Denver 5 by 5 Passport Program that provides unlimited family membership to 12 educational venues that support and enrich learning including: the Denver Children’s Museum, Denver Museum of Nature and Science, Wildlife Experience, Colorado Ballet, Denver Aquarium, just to name a few!